Chicago's first snow of the season made for a dangerous, icy morning commute. Flurries ended the city's bid for "latest snowfall" in years, and though snow merely dusted the ground, roads and sidewalks were slick, causing several accidents early Friday. Two fatal crashes occurred in Will County on I-80, and a fatal accident involving a truck and pickup truck happened around 7 a.m. on the Eisenhower Expressway, according to state police. A person in the pickup truck died. In addition, northbound Harlem was shut down at 153rd in Oak Forest for a two-car rollover crash. Accidents were reported at eastbound Euclid at Elmhurst Road and Calumet and 141st Street, as well. 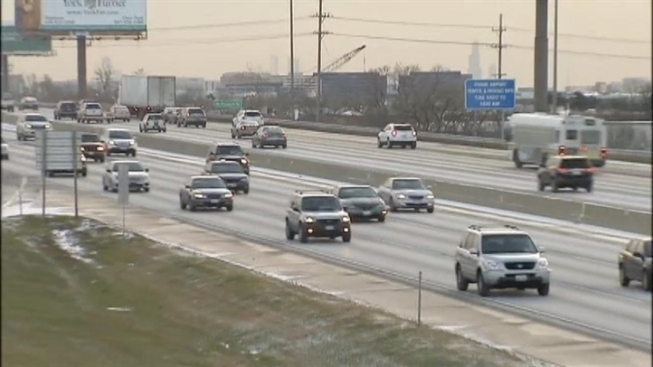 Two accidents involving 10 cars were reported as well, all caused by "slick pavement," according to the Illinois Department of Transportation. There were only minor injuries and all lanes were re-opened. According to the National Weather Service, the half-inch snowfall recorded at O'Hare Airport Friday ties for the fifth latest start of measurable snow in Chicago. The latest clocked in on Dec. 16, 1965. Chicago usually sees snowfall by late November, and after Friday, there isn't much more in the forecast. Clouds will break for sunshine Friday afternoon as Chicago heads into a warm-up early next week. Friday winds set the stage for the coldest night so far this season with low temps in the single digits. That changes Monday when highs are expected to hit 40.